Come to the Cabaret! 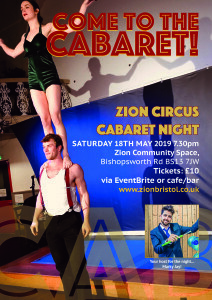 Another incredible Circus Cabaret comes to Zion this May... After our sell-out show in February, Marky Jay comperes another amazing night of top circus and cabaret acts for your entertainment... from magic to acrobatics and everything inbetween! Doors open 7.30pm, bar and nachos available on the night, over 14 years only.